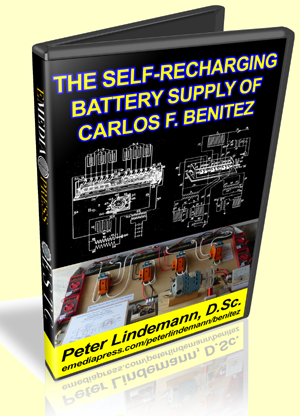 Self-Recharging Battery Supply of Carlos F. Bentiez by Peter Lindemann, D.Sc. I've gone over, again, the E motor secrets thread and now we are starting on a 1.3HP universal motor. Plan to get it up to snuff and go for the PL demo Benitez rig. I received the above info and reviewed it from a impartial stand point. I found the video to be of very good quality and presented in a clear to understand format for the beginner to have a understanding. That being said I find the advertising of this info not to be as presented. For even the presenter stated at the end that it could not keep up a charge on the battiers due to there size. I also take a differing opinions as to what the patents say and what was presented in the video. I have read all the patents several times and worked with this system and have no doubts to is valid claims if you can get all the proper componets in the proper parameters.But this is not what is shown. The advertising claimed the you could it on your own if you knew the proper components, but this video would give that information. It did not fulfill that that claim. But what was shown is not what is in the patents. And am sure there will be some that disagree but read the patents and replicate them. This is not an easy system to get to work as its presented to be. Therefore I think it is misleading at best as to what's presented. I don't want my money back as I did this to give a impartial opinion of the material being presented. Any serious experimenter would find this of no use and all info can be had with a search on the net. Not that they didn't give you good info of the patents as they did and I commend them for that. But I find there version of them lacking any real use other than to teach someone who knows nothing about it or energy systems. I think Emedia press presents info for the novice or beginner but for any real info you should look elsewhere or go it in your own . As the info presented is of no real use for energy production. This post is my opinion others may differ but I have been around the forums and this field for sometime now. I find no real information presented so I don't endorse this video or the presenter. Your money is better kept in your wallet. I believe Peter covered that in his presentation: Bedini SG - Beyond the Advanced Handbook. He talked in depth about the benefits of the diode. If you're talking about the same one in the same place that is.